Rovio and the NFL are working together to get football fans interested in the foul fowl known as the Angry Birds. Angry Birds 2, which launched in 2015, now allows you to dress up the birds by having them wear the uniform and helmet belonging to any one of the 32 NFL teams. The game will have new levels added along with in-game competitions. 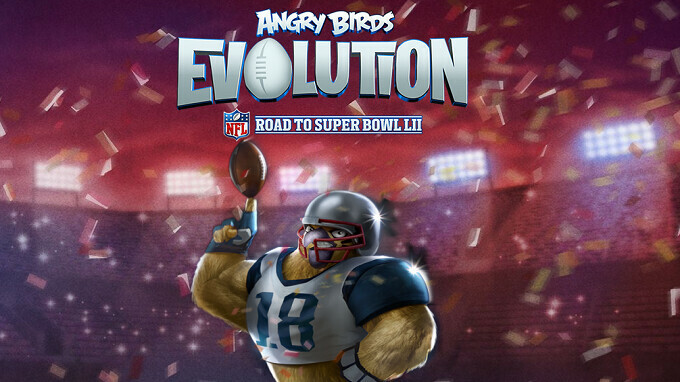 And Angry Bird Evolution, which launched last summer, now features NFL players to battle against. A new bird called the "Quarterback" has been added to the game, although we don't expect to see it named Tom Birdy or Nick Fowls. The football theme starts tomorrow on both the iOS and Android variants of both games. The NFL uniforms and game play will be offered for a limited time only. Game developer Rovio is hoping that despite the sharp decline in year-over-year television ratings for the playoffs, the NFL still has enough pull to attract large numbers of new players to Angry Bird 2 and Angry Bird Evolution.